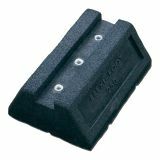 Here at Drainage Superstore we have a range of access risers and upstands for services, in a range of sizes and shapes to suit your requirements. Cable and tray pipework support feet have been designed to support small pipework and runs of cable tray. As well as installing a Flexi-foot strut for everyday pipework and cable baskets, they can also be build up with additional struts to support elevated services. This means that they can also be used to mount air conditioning units, air source heat pumps, and other outdoor equipment. If installing solar panels – thermal or photvoltaic – on flat roofs, you can also use Flexi-Foot support feet. 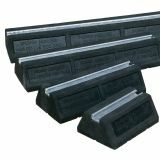 Flexi-foot support feet are manufactured from heavy duty recycled rubber, with a galvanised steel strut integrated, which has been fixed with industrial strength adhesive. The product is therefore dense, making it suitable for a range of building services supports. They also feature drainage slots underneath in order to allow efficient rainwater run off.